Visualization is an essential tool for making sense of big data. It provides a far richer view of big data than can be obtained from tables and statistics alone. However, the key to effective analysis of big data is the integration of visualization into analytics tools so that all kinds of users can interpret big data from a wide range of sources — click-streams, social media, log files, videos and more. IBM has embedded visualization capabilities in a number of solutions and also offers extensible visualizations that can be downloaded for use in business analytics solutions. 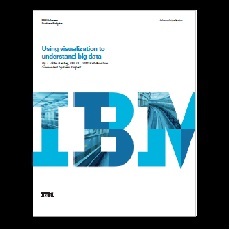 All the visualizations in this paper were created with IBM solutions and standards. To access white paper, click here.